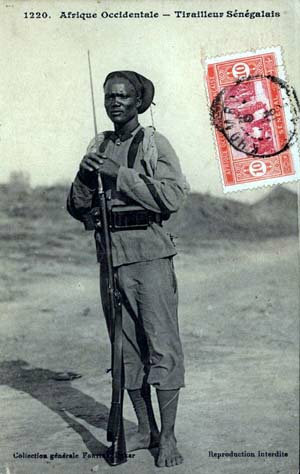 The Red Shadow is an Algerian Scout (Goumiere) employed by the French in their pacification of South Eastern Morocco, Western and Southern Algeria. Usually attached to the Legion Etranger he is feared by the Arab Tribes as a the mighty desert warrior, undefeated in personal combat, unmatched in horsemanship and incomparable in marksmanship. One hundred and fifteen men has he killed with his own hands, fourteen great wounds received in battle. The Red Shadow is the inspirational nucleus for a series of wargame battles played with military figurines and set amidst France's pacification of Morocco, Algeria the Sahara and West Africa at the end of the 19th Century. His great exploits bring him in contact with the French Foreign Legion, Zouaves, Chausseurs D'Afrique Spahis the Spanish, Germans, US Marines and of course the disparate warring Arab and Berber tribes. His adventures south of the Sahara bring him into conflict with the Mandingo Empire of Samori Tourey, The Tukulor Empire and the Central Sudan Sultanates. The name "Red Shadow" is inspired by the character from Sigmund Romberg's 1926 operetta "The Desert Song". In the opera, the Red Shadow is a masked bandit leading the Berber Tribes against the French. Out of disguise he is Pierre Birabeau, the bungling son of a general in the French foreign legion. In our "on table" miniature operettas, the Red Shadow is an Algerian Scout predating the setting of Romberg's novel by up to 40 years. We like to think that Romberg's character borrowed his name form 'our' Dime Novel Hero. Many of his adventures are inspired by the Romantic era of the late Victorian, early Edwardian spirit of colonial adventure immortalized by such writers as P.C. Wren, author of Beau Geste. Using a set of game rules, "The Sword and the Flame", exciting battles can be fought using miniature model soldiers with as few as 40 figures for the French and about twice that many for the Arabs or Berbers. Scenarios are inspired by our own imaginations and also from movies such as March or Die, Beau Geste or The Wind and the Lion. Check out the inspirational movie and book section section for more scenario ideas. 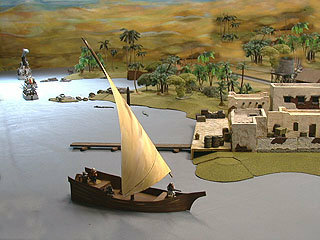 Although most of our on table miniature operettas are based on fictional events, they are inspired by the history of French colonialism in Africa. You will also find on the site information pertaining to Frances African history and its establishment of an empire greater than Napoleons. You will also find information and histories of the cultures and empires absorbed into this empire. Although we "play up" the romantic legacy of this period - at no time do we loose sight of the view of those nations conquered. Some saw the French as liberating them from the yoke of slavery imposed on them by other warring cultures, others saw them as power hungry interlopers in the affairs of free and independent nations. What ever your view - we hold no judgment. We retain the utmost respect for all cultures and races involved in our "table top" interactive games. We hope to also introduce you to some of the glory that was pre colonial Africa. Any references that may be construed as racist or derogatory are "in character" reflections of the participants of this struggle - from both sides, and do not reflect our opinions. We retain the highest respect for all races, cultures and nations of this period. Please join us into our fantasy world of miniature wargaming. Need a source for wargame figures, books and accessories?